As most of you know, SolarYpsi has not incorporated nor a 501(c)3, so we can’t directly receive any year end donations. However, I would like to suggest to everyone a way to “Double Dip” on your charitable contributions this year. 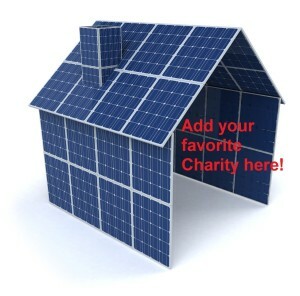 Consider giving the gift of solar power instead of cash to your favorite charity. Whether you love animal shelters, food banks, health centers, farmer’s markets, or any other organization doing great work, instead of giving cash consider giving a solar donation. This way you help both the charitable organization and grow solar power in our community. Ask the organizations you support if they have solar power or would consider installing solar power on their building. Ask them if you can give a directed donation to go towards a solar installation on their building. If the organization needs help understanding solar power, SolarYpsi can help explain solar power and help them design a system for their building. If we assume the receiving organization uses the same amount of power as a typical Michigan home of 600 kWh per month, a 5000 watt solar installation would make them 100% solar powered. A solar contractor should be able to install a typical system for about $3/watt, so a project would cost the organization about $15,000. Just yesterday I looked at my DTE bills for 2015 and added up all my charges and divide it by all the power I purchased and I’m paying about $0.19/kWh. This 5000 watt installation would make (20 kWh/day * $0.19/kWh * 365 days) $1,387 worth of power per year. A $15,000 donation for a solar installation would actually give the organization a minimum of $41,610 worth of power over the next 30 years. The gift of solar power is the gift that keeps on giving and can supply power to an organization for the next 30 years! This frees up operations funds for doing more good in our community. SolarYpsi’s founding web developer, Nik Estep , is moving on to new projects, so we need to find a new person or company to take on the tasks of maintaining the website. The website uses MySQL, PHP, Google analytics, HTML, Google maps, cron jobs, Word Press, QR tags, and uses an API to pull data from the Enphase solar data collection site to plot locally on SolarYpsi. The website currently uses GitHub to manage bug fixes and feature requests. The code base is very stable with over 60 solar installations map on the website. The content is added by other people, but the SolarYpsi web developer would need to fix occasional issues and implement new features as we grow the number of installations to hundreds of locations. Current feature requests include a way to sort the locations by size, installer, type of equipment, etc. We would also like to start pulling data from SolarEdge’s using their API. Any new ideas and/or feature would be welcomed. Contact Dave@Strenski.com if you’re interested in helping out. We don’t have any money, so this would be a volunteer position.